If you read last weeks post, you will know I am setting up to build a user based report that will give the reader a lot of the same data you see in the standard Sage SalesLogix Visual Analyzer and the Sage SalesLogix Dash Board. Last week I provided you the ability to effectively set goals for your users by updating the Manage Quota area of the SalesLogix LAN and actually creating the functionality for the SalesLogix 7.5.3 Web. This is available to you via the bundles attached to the post. 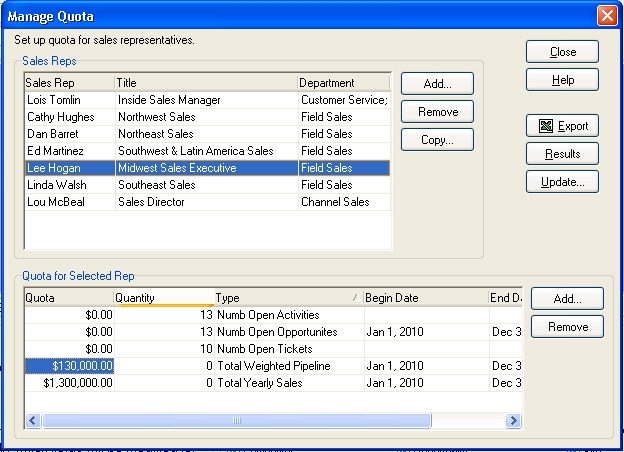 This week I am providing you a means of grabbing the quota’s for each user out of the SalesLogix database by providing you an example of a SQL view. But first, I have added some text to the “About This Blog” section that I will reference from time to time just to remind everyone of my goals in delivering information to you through this blog, please feel free to click on this link to read. So with the bundles from last week in place I have added some Quotas for some of the users in my eval system. The below screen shot gives you the examples that I have established. Lets look at the data in the Quota Table. This is not plug and play SQL view, you have to customize this script to match the quota types that are set in your system. There is a lot going on here and I will try to explain this a bit so you understand. 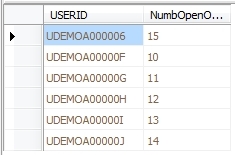 Now the first part of the “From” portion of the view statement supports the first columns by providing SQL a list of all usersid in the system. To make it easy, think of this as a table of data for SQL to use while it is building the view, this particular table was named “t2”. This matches the data to the established UserId in the 1st column, The “Inner Join” cleans out our view a bit because only records from the user table that have records in the t2 table will display records in our SQL view. The only real difference is instead of “Quantity” field we are using “Amount” field. The rest of the embedded SQL is basically the same. Select whether the value you want is currecny (Use the Amount Field) or a number (Use the Quantity field). The label for the Column in the view must match in both the Select Portion and the embedded SQL in the From portion of the SQL view. Take your time while doing this. Remember your are building a view, you are not effecting your data or hurting your system so do not feel like you are breaking anything. SQL is one great tool and I have a lot of fun playing around and seeing what I can do. One other thing, fight for the right to have access to your SQL data. You are the report writer, you cannot really write great reports without access to the wonderful world of SQL.